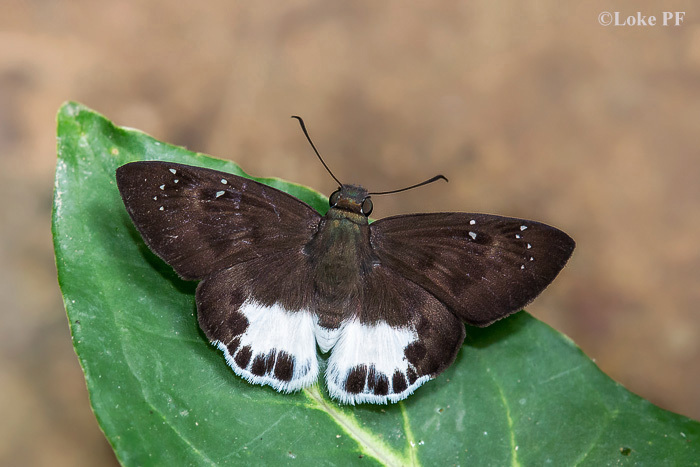 The Ultra Snow Flat is another relatively rare species of the Tagiades genus. Of the four species extant in Singapore, this species is very local, and can often be encountered at certain favourite locations quite regularly. Like its related species, it sunbathes with its wings opened flat on the top surfaces of leaves, and feeds on flowers with its wings opened flat as well. It is a fast-flyer and is often skittish and alert to movements. The Ultra Snow Flat was not recorded in the early authors' checklists, and is a new discovery for Singapore when it was recorded in the mid 1990's. With the typical dark brown forewings with the usual spots, it also features a whitened tornal area on the hindwing, but with a series of large black marginal spots. This individual was shot by ButterflyCircle member Loke PF.